One of our hopes is that we become, and help others become, better global citizens of the world by helping them discover culture, language, and world perspective. 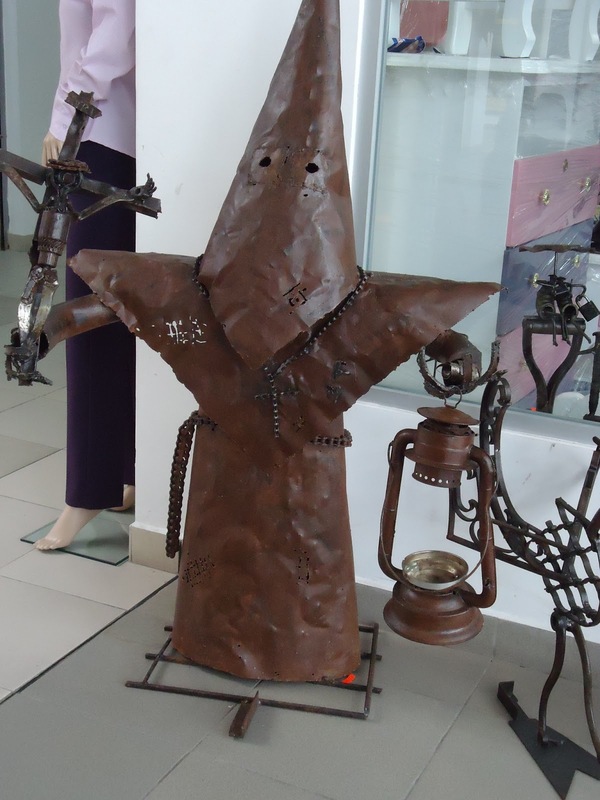 Your traditions and customs may not always translate well in another country. 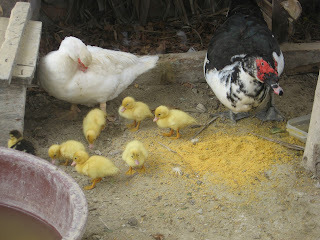 In Ecuador Easter is not commercialized with baskets, chocolate bunnies, candies, or hidden coloured eggs. 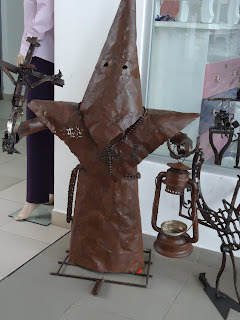 However, this predominately Catholic nation is rich with many different celebrations throughout the country including special ceremonies, processions and many other events. 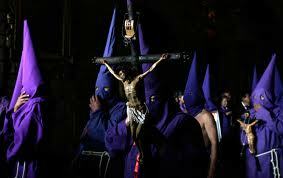 Semana Santa ( Easter - Holy Week ) is a very important time of religious celebration here between Palm Sunday and Easter Sunday. Quito, our capital becomes the epicentre of commemorations and will host most of the events. During the entire week of Holy Week Quito's churches and convents become venues for superb concerts of classical and religious Music. Palm Sunday commemorates the entrance of Jesus into Jerusalem, where he was welcomed with palm and olive branches that were placed in his path. Residents in each city will take decorative items woven from palm leaves to mass to be blessed, and then return the items to their homes where they will remain until the following year at which time they will be burned and the ashes used during the ceremonies of Ash Wednesday. Ash Wednesday is 46 days before Easter. As Easter falls on a different date each year so will Ash Wednesday. Ash Wednesday is the first day of Lent in the Roman Catholic Church, in the preparation for the resurrection of Jesus Christ on which is Easter Sunday. While Ash Wednesday is not a Holy Day of Obligation, all Roman Catholics are encouraged to attend Mass on this day in order to mark the beginning of the Lenten season. The Metropolitan Cathedral in Quito holds the very solemn ritual of "La Resena" on Holy Wednesday. During Mass, the ashes which gave Ash Wednesday it's name are distributed. The ashes are made by burning the blessed palms that were distributed on the previous year's Palm Sunday, many churches will ask their parishioners to return any palms that they took home so that these can be burned. After the priest blesses the ashes and sprinkles them with holy water, the faithful come forward to receive them. The priest dips his right thumb in the ashes and, making the Sign of the Cross on each person's forehead, says, "Remember, that thou art dust, and to dust thou shalt return" (with some word variation ). The Dragging of the Robe is a very unique tradition that only takes place in three cities worldwide - Quito – Ecuador, Lima – Peru and Seville – Spain. The Municipal Cathedral is the stage for the "Arrastre de Caudas," or Dragging of the Cape procession. The Dragging of the Cape is a ritual that originated from the Roman Empire, the Roman army would pay homage to a fallen General by waving a flag over his soldiers in a symbolic act of passing his valiance and spirit to his troops. 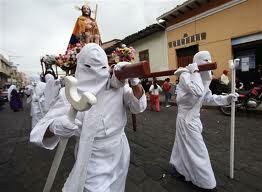 The tradition has been adopted by the Catholic Church and is performed throughout the Catholic world. The ceremony is performed in honor of Jesus which is in the place of a fallen General. The Archbishop waves a large black flag with a red cross over his followers, which are called canónigos, who are prostrated before him, symbolically transferring the spirit of Jesus. Holy Thursday is the oldest of the celebrations of Holy Week. This is the day on which Jesus celebrated the Last Supper with his disciples which was four days after Jesus' triumphal entry into Jerusalem on Palm Sunday. 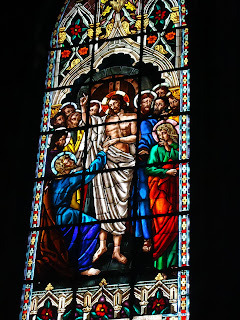 Holy Thursday is the day on which Catholics commemorate the institution of three pillars of the Catholic Faith: the Sacrament of Holy Communion, the priesthood and Mass. It is during the Last Supper that Jesus blessed the bread and wine with the very words that Catholic and Orthodox priests use today to consecrate the Body and Blood of Christ during the Mass and the Divine Liturgy. Jesus told his disciples to "Do this in remembrance of Me," He instituted the Mass and made his disciples the first priests. The "Cleansing of the Feet" ceremony takes place in the Cathedrals of Quito and of course other cities on Holy Thursday, to commemorate Jesus' humble gesture of cleansing his apostles' feet. In only a few hours Jesus' Crucifixion will be on Good Friday. Good Friday, which is the Friday before Easter Sunday, commemorates the Passion and Death of our Lord Jesus Christ on the Cross. 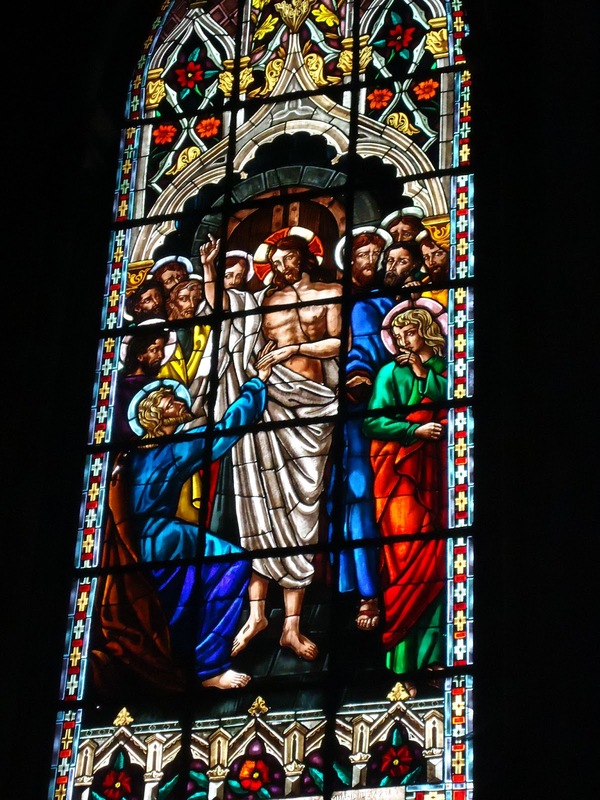 Good Friday is the second of the three days of Easter Triduum. permanently on a special alter at the San Francisco Church. The procession attracts thousands of foreign and local spectators that have come to admire the dramatic demonstration of religious faith. 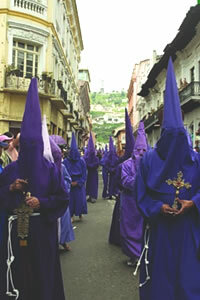 The most interesting characters in the procession are the "Cucuruchos", which are men of all ages dressed in long purple gowns, faces covered with purple masks and wearing very tall pointed purple cones. 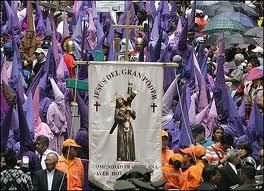 The color purple signifies penitence.This procession is one of the most dramatic demonstrations of religious faith. Many of the worshipers will walk barefoot, some will use chains around their arms and legs, and will conduct public acts of penitence in sign of repentance for their sins. The procession also has effigies of Christ and the Virgin Mary. In Guayaquil they held the 54th annual Procession of Cristo del Consuelo, a 17 block-long procession recollecting the passion, death, and resurrection of the Lord. About 500,000 participants led by the Archbishop Antonio Arregui started from the Temple of Cristo del Consuelo shortly after dawn. Firemen and police officers assisted participants unable to cope with the heat of the sun and fatigue and physical exertion from the journey. The end of the peaceful pilgrimage was marred when a large group of disrespectful evangelicals provoked the Catholic procession with insults, sticks, stones, and bottles, outside of the Espiritu Santo Church. Police separated them by using water cannons. Good Friday is a day of strict fasting and abstinence. Catholics that are over the age of 18 and under the age of 60 are required to fast, this means that they can eat only one complete meal and two smaller ones during the day, with no food in between. Catholics who are over the age of 14 are required to refrain from eating any kind of meat, or any food made with meat. On Saturday, the Mass of Glory in Alangasi celebrates Jesus' rise from the dead. During this mass, as the word "Glory" (Gloria) is verbalized by the Priest for a second time, parishioners cast the devils from the church. Two dozen devils will then immediately come out of hiding, exit the church and enter into the town square. They will later gather at the house of the "priosta", who is the financial sponsor of this celebration. This is where they will continue the celebrate with food and drink and a cleansing ritual that uses smoke. Easter Sunday is filled with solemn masses in remembrance of Christ's resurrection. At sunset on Easter Sunday a Bell Concert is performed in a magnificently synchronized manner by the hundreds of bells from all the churches, convents and cloisters which fill Quito's Historic Centre, this adds a magnificent component of culture and art to Holy Week. Cuenca, Holy Week in Cuenca has been declared a Festival of International Tourist Interest and many visitors are captivated by the beauty of it's pageantry. The festival dates back to the 17th century – penitential guilds – when the Trinitarians and Augustinians which were Cuenca's two most active communites, founded the first guilds and then organized processions through the streets of Cuenca. Holy Week is also Cuenca's Religious Music Week which was founded in 1962, this has maintained the distinct identity as a result of the carefully chosen programs and the fantastic setting in Cuenca and the great wealth of heritage which it encompasses. Cuenca also hosts a number of other cultural activities which include classical music events, folk music festivals, world music and jazz concerts. 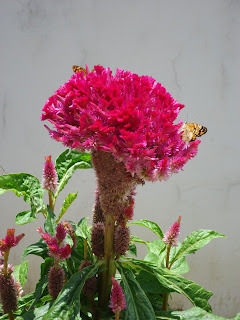 Both eastern life sciences, and here in the Andes suggest that the first 50 years of your life should take care of the material and the second 50, the spiritual. 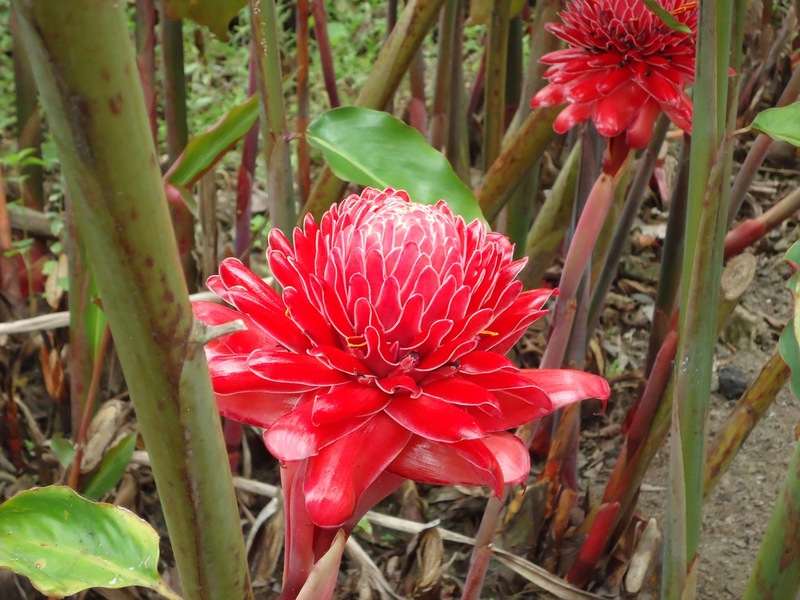 As in most holidays in Latin America and it is no different here in Ecuador – Lent and Easter have a very strong connection to food! 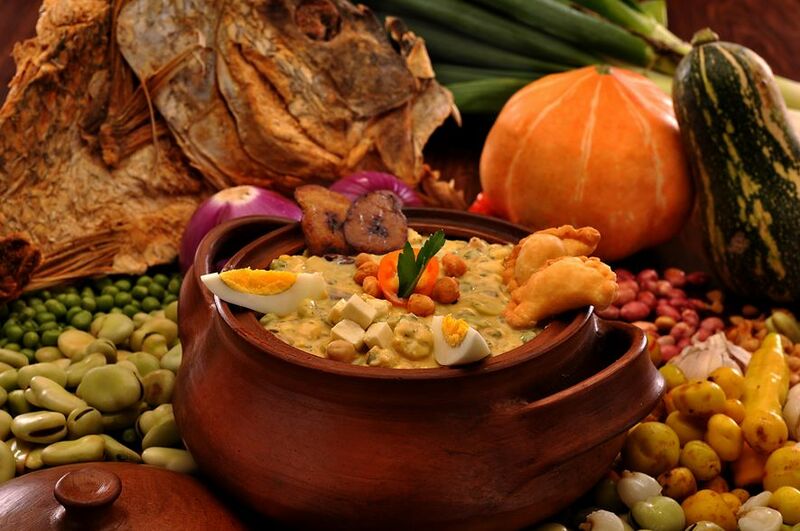 Ecuador's most important and popular dish for Holy Week is Fanesca, a thick soup heavy with local ingredients and religious symbolism. Fanesca was traditionally meant to be eaten only on Holy Thursday in reference to the Last Supper. Though recipes vary widely, fanesca traditionally has 12 grains or main ingredients, which represent the 12 apostles of Jesus. Because fanesca is eaten during Lent, meat is not part of the dish, but fish (traditionally cod) is included to represent Christ. Cuenca's Easter soup (Fanesca) is considered to be the best in all of Latin America and throughout Ecuador it is a tradition to have at least one bowl of it during Holy Week. Fanesca is served in mercado food courts and also in many restaurants until Easter Sunday. The preparation of Fanesca is very time comsuming and very labour intensive therefore is has become a social event which involves family members that will gather in the kitchen to clea, shell, pare, soak, slice, puree, salt and cook ingredients. The preparation time of making Fanesca can take up to two days. Fanesca can be served with a variety of side dishes such as: fried cheese empanadas, pickled white onions, hard boiled eggs (sliced), quesco fresco, fried plantains or fried pieces of dough (masitas). Fanesca is often served with a mashed potato dish called molo. Desserts can be candied figs or rice pudding. We have found that Laylita Recipes -is a great resource for Ecuadorian recipes. Fanesca is an Ecuadorian soup made with bacalao or salt cod, squash, fava beans, chochos, corn, peas, porotos or fresh beans, rice, onions, garlic, cumin, achiote, peanuts, milk, cream and cheese. Fanesca can be served topped with hardboiled egg slices, platanos fritos or fried ripe plantains, lime pickled white onions, queso fresco and fried cheese empanadas. Soak the salt cod in water for 24 hours, changing the water every 6-8 hours, each time the water should be less and less salty, at the end cut the cod into medium sized pieces (if it doesn't come already cut). Cook the diced butternut squash and zucchini separately, with a barely enough water to cover them, cook until they are very tender, drain the water and place them in a blender or food make a puree. Boil the shredded cabbage with a small amount of water for about 3 minutes, drain and add the cabbage to the squash puree. In a large stock pot or soup pot, heat the butter over medium heat to make a refrito or base for the soup, add the onions, garlic, achiote, cumin, oregano and pepper and cook until the onions are tender, about 5 minutes. Add the cooked rice to the refrito and mash it into the refrito with a potato masher to make a thick sauce or puree. Add the squash and cabbage puree and mix well. Add 4 cups of milk and the fava beans, corn, green peas, lima beans and cannellini beans, stir in well and let simmer for about 15 minutes, stir frequently to avoid the ingredients from sticking to the bottom of the pan. Meanwhile bring 6 cups of milk to boil, add the soaked and desalted cod, and boil for about 10 minutes. Add the milk and cod to the soup or if you don't want the soup to have the strong salted cod flavor then strain the milk and add only the milk to the soup, reserve the fish, fry it in oil until browned on each side and serve on the side or place a piece of the fried cod in each individual soup bowl. At this point you want to taste the soup and add salt if needed, how much you need will depend on the whether you add the salt cod to the soup or not (as well as how well you soaked and rinsed the cod). Blend the roasted peanuts with 2 cups of milk, add this to the soup, and cook for another 10 minutes, stirring frequently. About 5 to 10 minutes before serving, add the chochos or lupini beans, the heavy cream and the cheeses, stir to help the cheeses dissolve. Serve with the pieces of fried salt cod (unless they were already added to the soup), hardboiled egg slices, lime marinated white onions, fried ripe plantains, slices of queso fresco, fried cheese empanadas, and Ecuadorian hot sauce or slices of hot peppers. These can be added on top of the soup or on the side. Empanadas de viento (fried cheese empanadas) are Ecuadorian empanadas stuffed with cheese and onion, then fried and sprinkled with sugar. Mix the grated cheese and chopped onions together. Spoon the cheese filling on the center of the each empanada disc. Chill the empanadas for at least an hour, this will help them seal better and prevent leaks. Fry the empanadas either in a deep fryer or in a frying pan, if using a frying pan add enough oil to cover at least half of the empanada, let the oil get very hot and fry each empanada until they are golden on each side or about a minute per side. Capirotada, a baked pastry that can be both a breakfast food and a dessert, represents the crucifixion of Christ. The bread represents the body of Christ and the syrup his blood, with the cinnamon sticks thought to be the cross. The raisins become the nails of the cross and the melted cheese represents the Holy Shroud. Mix the flour, salt and baking powder in a food processor. Add the pieces of butter, orange juice and sparkling water – add 1/2 cup of the water to start and then add more as needed or until dough clumps begin to form. Place the dough in bowl, cover and let rest at room temperature for about an hour. Roll out the dough into a thin sheet and cut out round disc shapes for empanadas (use round molds or a small plate). It's really important to get the discs very thin since they cook very quickly when you fry them, if after cutting out the round shapes they are still thick,try rolling each disc a little more until it is very thin. Another way to do this is to make small round balls with the dough and then use a rolling pin to roll out each one individually. The discs don't have to be perfectly round. Use immediately or store in the refrigerator or freezer to use later. Molo is an Ecuadorian version of mashed potatoes made with milk, cream, queso fresco and a refrito of onions, garlic, and achiote or annatto. This is served with lettuce leaves, hard boiled eggs, hot pepper slices, avocados, scallions, cilantro or parsley, tomato and onion curtido and aji or hot sauce. Serve immediately, can be served in individual plates or in a large serving bowl garnished with lettuce leaves, queso fresco cubes, quartered hard boiled eggs, avocado slices, slices of peppers, chopped scallions and chopped herbs. The tomato onion curtido and aji sauce can be served on the side and added according to each person's preference. Aji criollo is a hot sauce or salsa that is very popular and a many typical dishes are served with this. Combine the hot peppers, cilantro, water, garlic cloves and lime juice in the blender and blend well. Add the chopped white onions and salt to taste. Curtido de cebolla y tomate is refreshing lime pickled red onion and tomato salsa or salad that goes great with the molo mashed potatoes. Mix the onions, sliced tomatoes and cilantro, taste and add salt if necessary. Slice the plantains, the best way to slice them is either diagonally or cut the plantain in half and slice lengthwise. The plantain can also be sliced lengthwise full size, but the smaller diagonal or half slices are easier to manage. The plantains will cook very quickly, make sure to turn them before they burn and cook until golden on each side. You can use a spatula or a fork to turn them. If the plantain flesh is still pink or white it means that it is not yet fully cooked. Place the cooked plantains on a paper towel to drain any excess oil. If adding cheese, sprinkle the feta over the plantains and serve. If you using a grated cheese then it is best to skip step #5, once the plantains are done leave them in the frying pan and add the grated cheese on top, remove from the heat to avoid burning them and let the cheese melt. 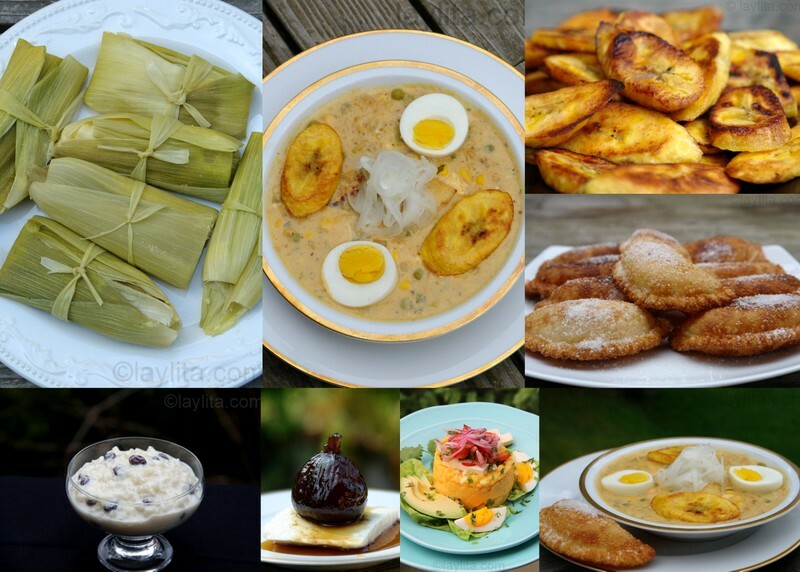 Ecuadorian humitas are savory steamed corn cakes or fresh corn tamales, made from a mixture of freshly ground corn, onion, garlic, cheese, eggs, and cream, which is placed inside corn husks and steamed. Remove the silky hairs from the corn and use a knife to cut the corn kernels from the cob, if you don't have a steamer save the cobs to use as a steamer. In large deep pot place about 2 ½ cups of water and a steamer, the water should be just below the steamer, if you don't have a steamer arrange the cobs on the bottom of the pan instead and cover them with some of the leftover husks. If using fresh tree tomatoes peel them, boil them for about 5 minutes to make it easier to peel them. If using frozen tree tomatoes, defrost them over night in the fridge, then cut them in half and scoop out all the insides. Blend the tree tomatoes with the hot peppers (seeded and deveined if you want it very mild, you can always save a few seeds and add them in if it's too mild). Transfer the blended mix of tree tomatoes and hot peppers to a small sauce pan, add the water (you can add more if you want a more liquid sauce) and cook on medium heat for about 5-8 minutes. Add the onion, lime juice, cilantro, chochos (if adding), and salt to taste. Classic Latin American Arroz con leche (rice pudding) dessert made with rice, milk, cinnamon, sugar, raisins, and condensed milk. Wash and rinse the rice very well. Put the milk in a medium sized pot with the orange peel, cinnamon stick, and pinch of salt. Bring to boil and add the rinsed rice. Cook on low heat for about 1 hour and 15 minutes, or until the rice is tender. Stir occasionally, increase frequency of stirring as the cooking time increases. Remove the cinnamon sticks and orange peel from the rice. Add the sugar or panela and raisins, cook for 15-20 minutes, or until it is tender and creamy. Stir frequently. Add the condensed milk, vanilla and rum to the arroz con leche and stir well. Remove from heat. Dulce de higos is a dessert of fresh figs cooked until candied in a syrup of panela or brown cane sugar and spices. These delicious figs are served with a slice of queso fresco. Serve either warm or cold with a slice of quesillo, fresh mozzarella, queso fresco, farmer's cheese or the cheese of your preference.